Size: 454 sq.ft. - 839 sq.ft. Shiv Shakti Tower 28 is a high end compact to large sized apartments building in the strategic address of Malad East, Mumbai. Tower 28 project is beyond luxury as these residences will suit every age with full safety, healthy environment for better and hassle free lifestyle. It is a under construction venture was launched in May 2016 spanning over the area of 2.50 acres to present you multi-storey residential towers. This housing complex compromises of lavish & spacious 3 high rise towers. Each apartment of Tower 28 is Semi-furnished conceptualized with fresh interior designs and perform as a pride for the developers. Tower 28 Malad is registered under MahaReraId: - P51800009511. The project completion date is scheduled for June 2021. Shiv Shakti Developers welcomes you to the Best of Malad East that is fully proposed with a peculiarly balanced lifestyle. This contemporary look is beautifully crafted with trendy facilities inside & out. Shiv Shakti Tower 28 is brilliantly introduced with the typology of 1 Bed, 2 Bed & 3 Bed unit type. 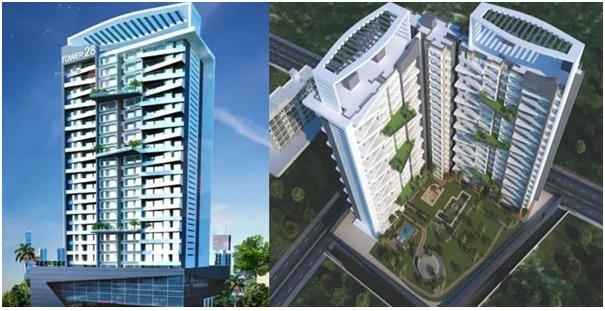 The project has collection of splendid & unique features at reasonable cost with the starting price 81 Lac to 93 Lac for 1 Bedroom flats, 1.1 Crore for 2 BHK flats & 3 BHK pricing starts from 1.50 Cr. About 540 units will be designed in this complex where each of the towers includes 24 floors with garden apartments. The carpet area of 1 BHK ranging between 445 Sq.ft to 530 Sq.ft, 2 BHK ranging between 610 Sq.ft to 655 Sq.ft and the 3 BHK flat sizes starts from 830 to 840 Sq.ft. The residence of Tower 28 will be awestruck to see the Grand Entrance Lobby created to perfection for you while the interior is having Semi Modular Kitchen, Jaguar Fittings in Bathing Room, branded fittings in toilet, Sound proof windows, Vitrified Flooring in all rooms, large living area and dedicated wardrobe niches. Shiv Shakti Group is operating since 2010in all types of properties. It is one of the leading real estate companies in Mumbai. Shiv Shakti Developers holds experience of 7 years. In these 7 years of period the group has changed the living lifestyle of thousands of people.As per the Customer demand for their every development they use good quality materials with unmatched details. This realty and infrastructure builders are Rajasthan based.The ongoing projects by Shiv Shakti developers are Shivshakti Blue Berry, Shivalika Residency, Shiv Sarovar and Tower 28. Malad East lies in the northern part of Mumbai with well-developed physical, civic and social infrastructures. Malad is divided into two parts West & East surrounded by other major commercial &residential localities Andheri, Goregaon & Kandivali. These neighbourhoods are served by Auto Rickshaw, BEST buses & Rails. Tower 28 locality is quite famous for good & reputed hospitals, schools, colleges, shopping centres and Banks. The international airport named Chhatrapati Shivaji is 11.8 Kilometres away from the site i.e. NH8 while Mumbai Central Railway is approx 30 Kilometres through same highway. Madhavbaug Sane Care Clinic, Ryan International School, Apollo Pharmacy are the nearest infrastructures from the site. For a Compulsive shopper the project location is housed with Evershine Mall, Inorbit Mall & Oberio Mall, for banking options there are no.1 bank branches Punjab National Bank & Central Bank of India. The location of Tower 28 is well suited for working people at Lower Govind Nagar, Haji Bapu Road, Malad East, Mumbai – 400097 with endless choices of transport facility. Shiv Shakti Developers have put together all essential amenities that comes with a Park, Landscaped garden, Gymnasium, Borewell, Power Backup facility, Swimming Pool, Jogging Track, 24 Hour Security, Rain Water harvesting, Lift, Resident Parking space, Visitor parking, Clubhouse, Tennis Court, Cycling track, laundry service, Cafeteria and many luxurious amenities.